A deeply disturbing character study of a handsome and sociopathic American in Paris, writer-director Antonio Campos's Simon Killer hones further the psychological perceptiveness and keen filmmaking craft exhibited in Campos's acclaimed feature debut Afterschool. Emotionally compelling and visually stunning, Simon Killer is an examination of casual brutality, profane sexuality, alienation, and desperation, all cut to a killer soundtrack that underscores the borderline psychotic fervour of Simon's descent. Our own Timothy E. RAW had this to say of the film: "Rarely has a portrait of a sociopath been so enigmatically engaging and mesmerizingly immersive... Simon Killer is a film of casual brutality and profane sexuality, all cut to a killer soundtrack." You can read the rest of his review here. 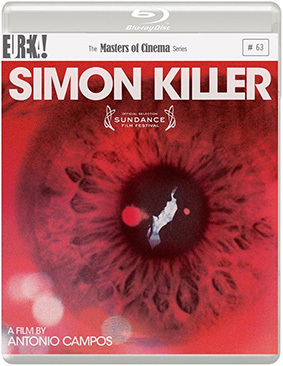 Simon Killer will be released on UK Blu-ray and DVD on 26th August 2013 by Eureka as part of the Masters of Cinema series at the RRP of £19.99 for the Blu-ray and £17.99 for the DVD. Booklet featuring a new and exclusive essay by critic Karina Longworth; a new interview with Antonio Campos; a visual primer on the development of the poster art; and more!